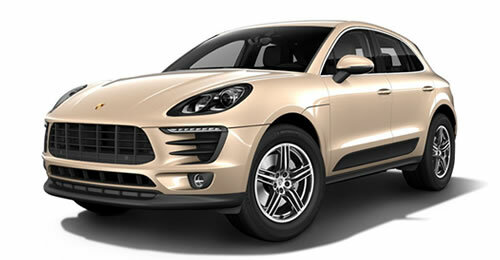 Porsche is introducing the third generation of the Cayenne. 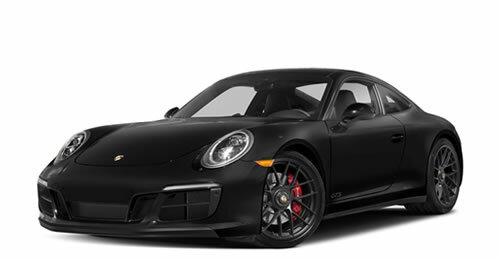 This successful model from the Stuttgart- based sports car manufacturer is launching as a completely new development and will combine even more of the typical Porsche performance with excellent everyday practicality. 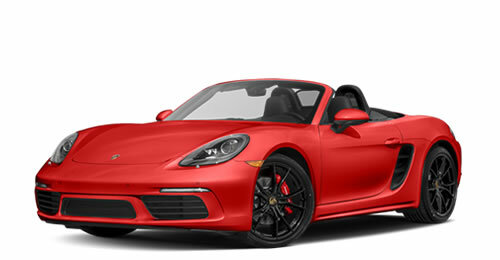 Its powerful turbo engines, new eight-speed Tiptronic S gearbox, new chassis systems and innovative display and control concept with total connectivity will take both sport and comfort to the next level. 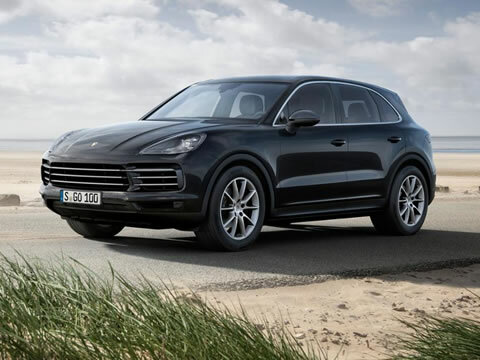 At market launch, there are two newly developed six-cylinder engines to choose from: The Cayenne’s 250-kW (340 hp), three-litre turbo engine delivers 29 kW (40 hp) more than the previous model. 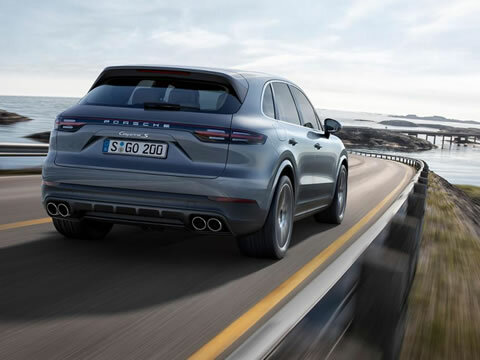 The 2.9-litre V6 biturbo engine in the Cayenne S, which reaches speeds of up to 265 km/h, brings it up to 324 kW (440 hp) – an increase of 15 kW (20 hp). Equipped with the optional Sport Chrono Package, the new Cayenne S accelerates from zero to 100 km/h in less than five seconds. 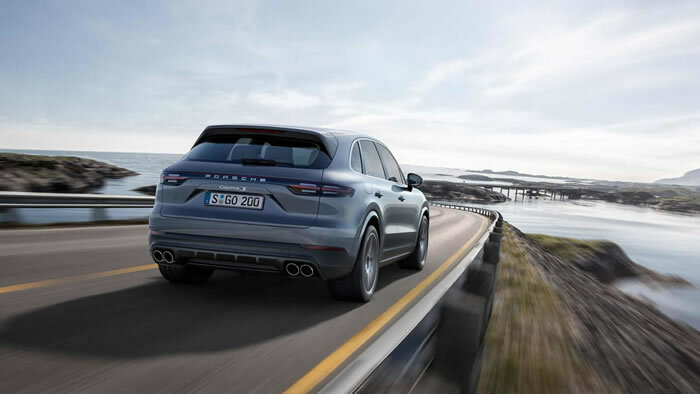 The Cayenne is based heavily on the iconic 911 sports car: The third edition of the SUV, which has also been enhanced visually, now has mixed tyres and rear-axle steering for the first time. 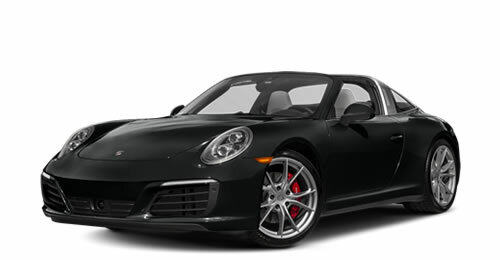 In addition to these typical sports car features, the on-road capabilities are further improved by active all-wheel drive as standard, Porsche 4D Chassis Control, three-chamber air suspension and the Porsche Dynamic Chassis Control (PDCC) electronic roll stabilisation system. 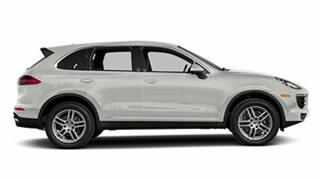 Despite its significantly extended standard equipment, the Cayenne weighs up to 65 kilograms less than its predecessor and remains perfectly suited to off-road use. The Cayenne’s expanded performance range, improving both sportiness and comfort, is due in no small part to the new eight-speed Tiptronic S gearbox. Shorter response times and sportier ratios in the lower gears enhance both on-road performance and off-road capability. At the other end of the expanded spread between comfort and sportiness, the long-transmission eighth gear ensures low torques, optimised fuel consumption and relaxed driving. Even on rough terrain, the Cayenne provides straightforward driving pleasure. Programmed off-road modes make it easy for the driver to select the right setup for their drive. The default setting is the Onroad programme. Four other modes activate the conditioning for mild off-road terrain: Mud, Gravel, Sand or Rocks. The drive, chassis and differential locks can be selected to adapt to the relevant scenario. 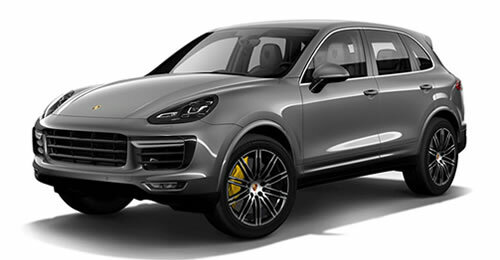 For power distribution, Porsche utilises the active all-wheel drive in all Cayenne models. 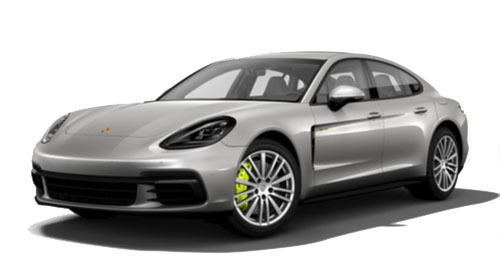 The intelligent, fully variable Porsche Traction Management (PTM) distributes the driving force between the drive axles. 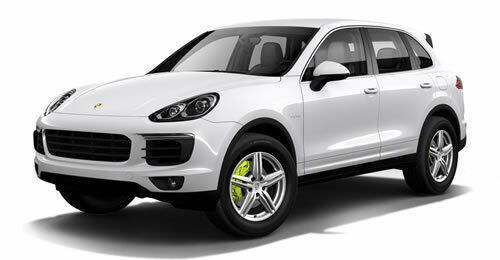 Its hang-on concept is a key principle for the excellent sporting performance of the Cayenne. At the same time, it fulfils all requirements for extensive traction on rough terrain. 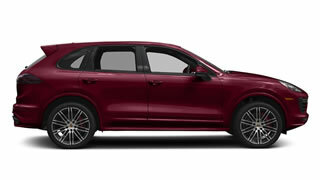 The introduction of the optional Sport Chrono Package takes the new Cayenne even closer to its sports car counterparts. Just like in the 911, the driver selects the driving mode via the mode switch on the steering wheel. In addition to Normal, Sport and Sport Plus modes, the driver can also select the “Individual Mode”. This mode allows the driver to store an individual set-up and select it simply by rotating the mode button. 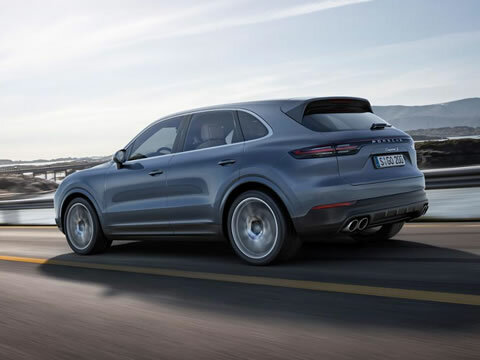 Sport Plus mode activates Performance Start for optimum acceleration from a standstill, optimises all chassis systems for performance, sinks the air suspension to the lowest level and adjusts the angle of the roof spoiler on the Cayenne Turbo for optimum downforce. The Sport Response button in the centre of the mode button enables the driver to optimise the Cayenne for ultra-high responsiveness for a period of 20 seconds. This unlocks the maximum performance of the engine and the transmission for overtaking manoeuvres at the push of a button. 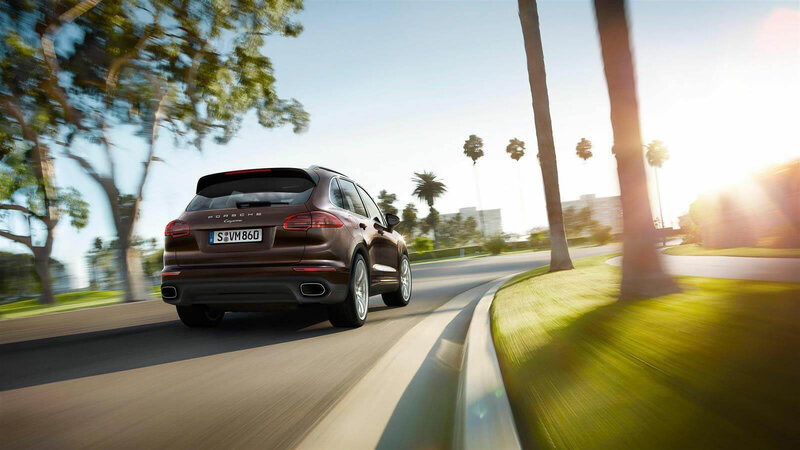 In this mode, the Cayenne responds even more rapidly to the driver stepping on the accelerator, immediately converting this signal into optimal acceleration. The instrument cluster shows the driver, via a countdown timer, how long the Sport Response function will remain active. The performance boost can be used as often as required. When the Sport Response function is active, it can be ended manually at any time by pressing the button again. 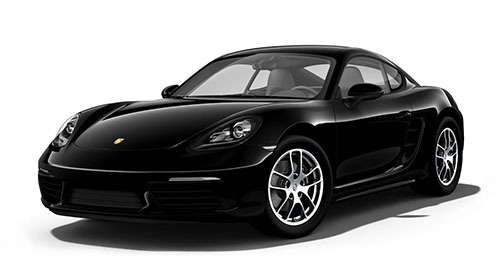 As in sports cars, the Sport Chrono Package also includes the separate PSM Sport mode. In a safe environment, ambitious drivers can take the Cayenne closer to its limits, with the Porsche Stability Management (PSM) system tuned for maximum sporty performance. PSM remains active in the background. PSM Sport mode can be enabled regardless of the selected driving mode. The new engines are packed with technological innovations. The exhaust turbochargers are arranged in a central turbo layout inside the cylinder V. This results in an engine with significantly more compact dimensions, allowing it to be installed in a deeper position inside the vehicle – which lowers the centre of gravity and improves lateral dynamics. 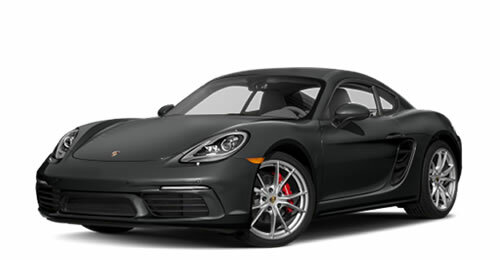 The shortened exhaust paths between the combustion chambers and the turbochargers produce a more spontaneous engine response and a faster build-up in power. 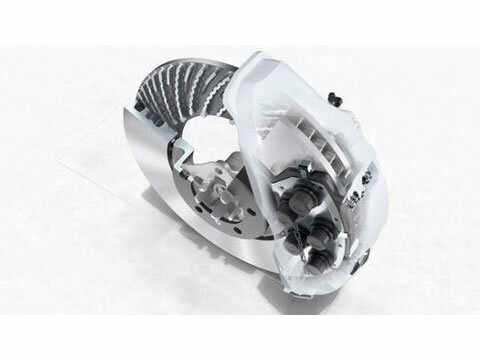 The new counter-rotating twin-scroll turbochargers deliver high torque at lower engine speeds. They also help to boost the response speed of the engines. As exhaust gases are kept completely separate, the gas columns generated by the individual cylinders are virtually unaffected by their counterparts – a particular advantage in the V8 engine, and a design that also boosts efficiency. Innovative production processes and materials are used in the manufacture of the engines. The weight of the crankcase for the eight-cylinder engine, for example, was reduced by 6.7 kilograms (a reduction of 14.6 per cent) by using a sand casing core package manufacturing technique. The rigidity of the component was also increased through the use of high-strength, quadruple-bolted main bearing covers. The linings of the high-performance machine boast a virtually wear-free iron coating, which is applied using an atmospheric plasma spraying process. The six-cylinder engines also feature a range of innovative solutions. 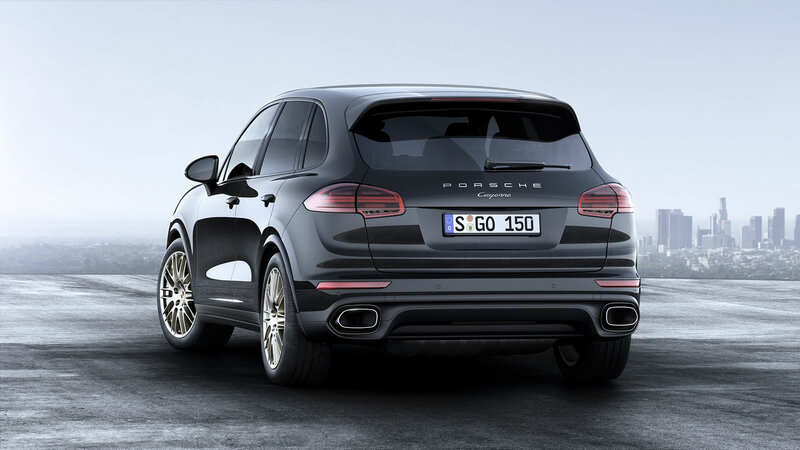 In the 2.9-litre engine of the Cayenne S, the exhaust manifold is integrated into the cylinder head. As well as reducing weight, this design means that the exhaust manifold is surrounded by cooling water, which ensures that the combustion process is efficient, even under full load. 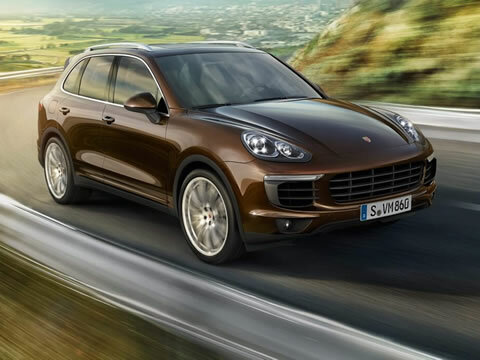 Porsche has developed a completely new generation of drives for the Cayenne, including the eightspeed Tiptronic S automatic transmission – which now delivers an even sportier and more comfortable drive than its predecessor, in line with the characteristics of the new Cayenne. The transmission combines significantly faster shifting speeds with even more comfortable and smooth starting characteristics. It also reduces traction interruption during gear changes. New sun gear and planet gear sets result in a wider gear spread: First gear is now shorter than in the predecessor model, while eighth gear is longer. This approach improves the initial acceleration performance of the Cayenne while also boosting comfort and fuel efficiency. Thanks to the new shift-by-wire technology, the shift paths in the manual shift gate have been kept very short, which in turn reduces the necessary shift forces and ensures even more comfortable operation. And, thanks to its position and design, the selector lever offers the ideal contact surface for manual operation of the infotainment system. The new, even more clearly differentiated driving modes enable the driver to benefit from the new transmission tuning. In “Normal” mode, the automatic transmission shifts to the higher gears quickly and smoothly to save fuel. In “Sport” mode, the Cayenne’s Tiptronic S feels very sporty, allowing fast gear changes with short acceleration times. 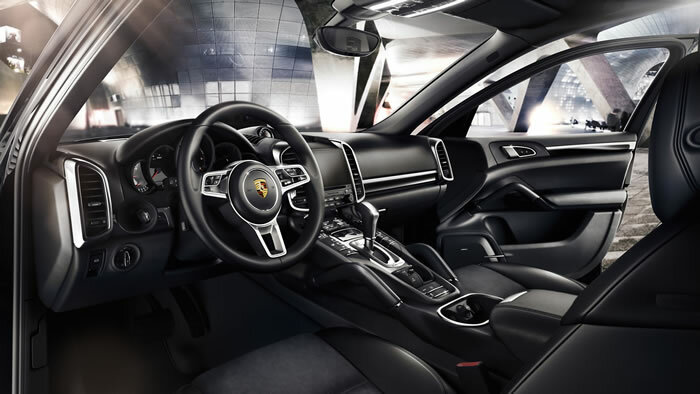 With the optional Sport Chrono Package, the driver can use the mode switch on the steering wheel to select driving modes directly – a feature that Porsche first presented in the 918 Spyder. 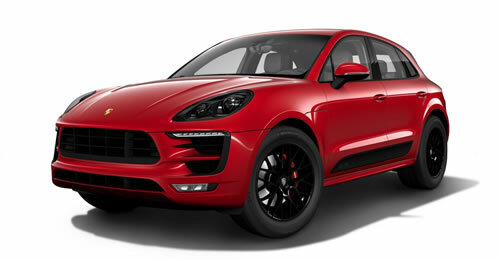 All Cayenne models achieve top speed in sixth gear. The seventh and eighth gears, along with the coasting function, are designed for maximum efficiency and to improve driver comfort on long-distance journeys. The low engine speed further reduces the noise level in the interior. The auto start/stop function has also been subject to further development, and now switches off the engine as the car coasts to a stop when approaching a traffic light, increasing comfort and reducing fuel consumption. The auto start/stop function is automatically deactivated in the Sport and Sport Plus driving modes. The new transmission also has benefits if the Cayenne is used to tow another vehicle. Very few vehicles are able to pull a trailer load of up to 3.5 tonnes so effortlessly. 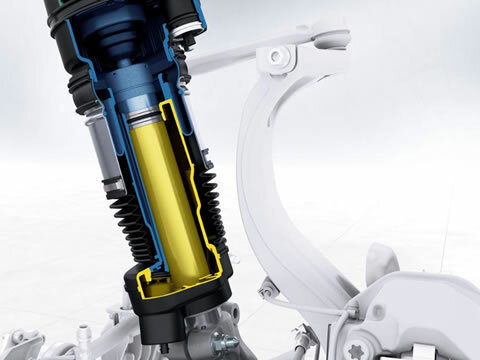 Thanks to the torque increase of the converter, the transmission can transfer very high torque even at start-up and during manoeuvring. 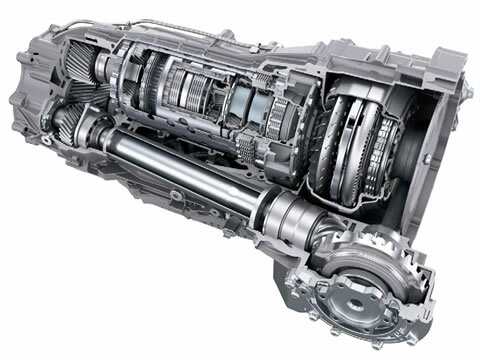 First gear is also around four per cent shorter compared to the previous transmission model. This allows the vehicle to be driven very sensitively, especially at very low engine speeds, which is also a significant advantage off road. 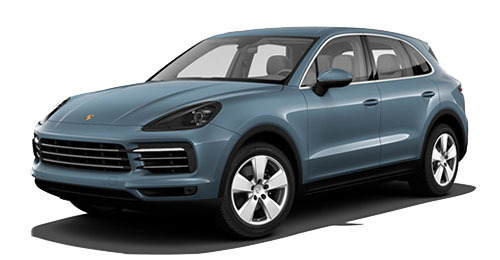 The new Cayenne features a brand-new range of engines. 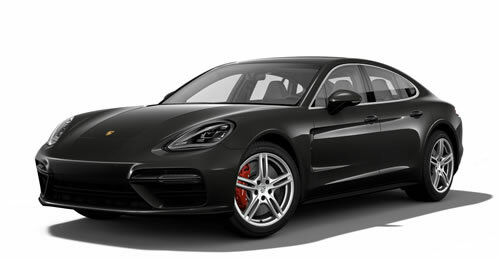 The six and eight-cylinder turbo engines originally made their début in the Panamera. 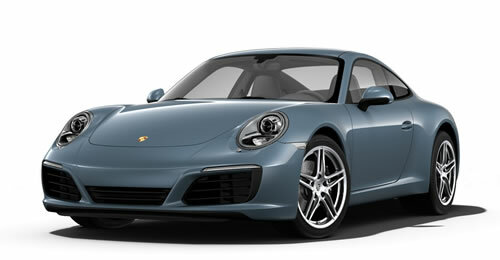 Porsche has developed these engines in pursuit of its downsizing concept. All engines have a smaller displacement but deliver more power and torque than their respective predecessor models. The basic engine, combustion processes, gas cycles and charge technologies in the new generation of engines are all optimised for improved performance and even greater fuel efficiency. 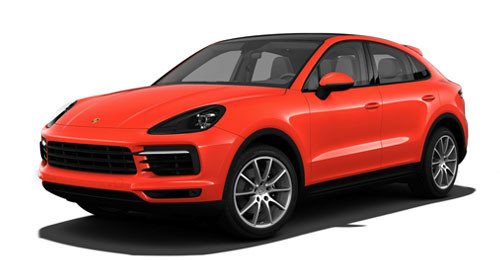 Take the Cayenne S as an example: In spite of its 15 kW (20 hp) greater engine power, the new six-cylinder engine boasts an NEDC combined fuel consumption of 9.4 to 9.2 litres of Super Plus fuel per 100 km. 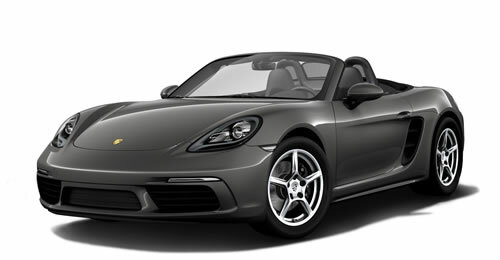 The driver also benefits from the further improvements made to the responsiveness of the new engines. Under the bonnet of the standard model lies a turbocharged V6 engine with three-litre displacement, delivering an output of 250 kW (340 hp) and 450 Nm of torque. 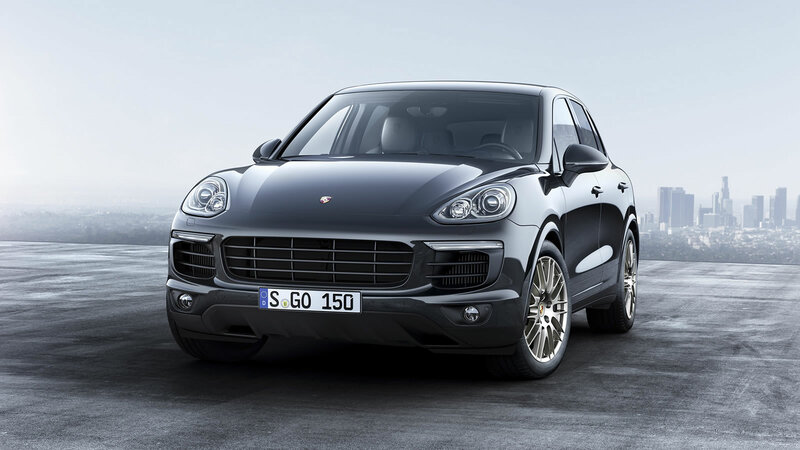 The Cayenne S is powered by a biturbo 2.9-litre V6 engine with an output of 324 kW (440 hp) and 550 Nm of torque. 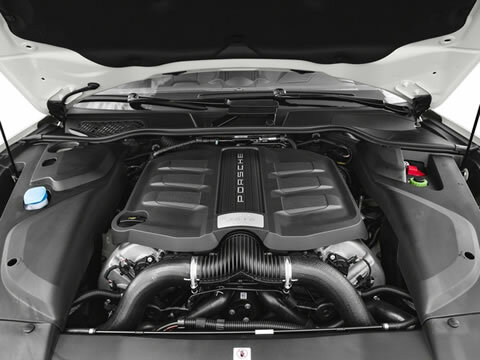 Finally, the Cayenne Turbo is driven by a four-litre, eight-cylinder engine with two turbochargers, generating an output of 404 kW (550 hp) and 770 Nm of torque. 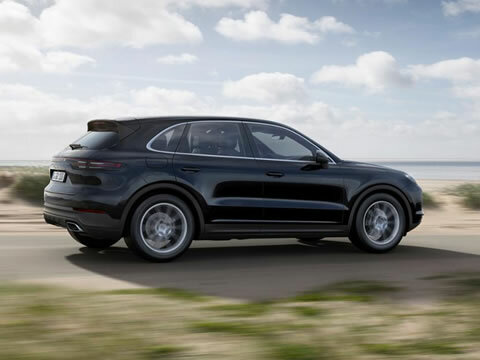 The specific performances of the petrol engines have been boosted from 83 to 110 hp/l in the Cayenne, 117 to 152 hp/l in the Cayenne S, and 108 to 138 hp/l in the Cayenne Turbo, resulting in a significantly improved driving performance. The Cayenne accelerates from zero to 100 km/h in 6.2 seconds (or 5.9 seconds with the Sport Chrono Package), and achieves a top speed of up to 245 km/h. 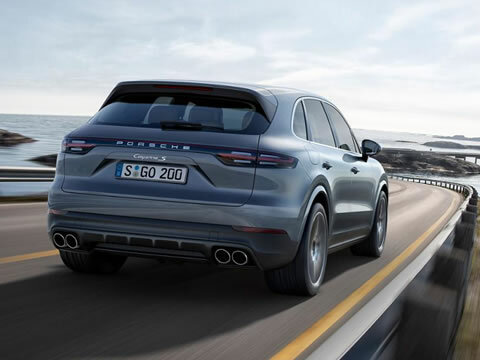 The Cayenne S, which can achieve a top speed of up to 265 km/h, knocks another second off this acceleration time and is capable of reaching 100 km/h from a complete standstill in just 5.2 seconds – 0.3 seconds faster than its predecessor. Thanks to the faster-shifting Tiptronic S gearbox, the Sport Chrono Package reduces the acceleration time by another half a second, from 5.4 seconds to just 4.9 seconds. 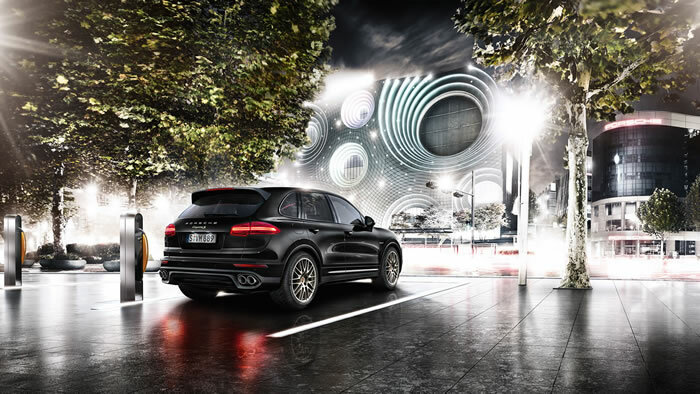 The Cayenne Turbo reigns supreme in acceleration, coming in at just 4.1 seconds (or, with the Sport Chrono Package, 3.9 s), surpassing the performance of even the current Cayenne Turbo S. The new top model achieves a top speed of 286 km/h. 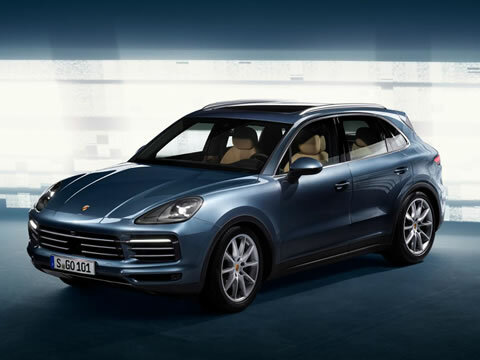 The Porsche Cayenne is the epitome of the sporty SUV – and now the new generation of this legendary car has arrived, with a significantly increased performance range. 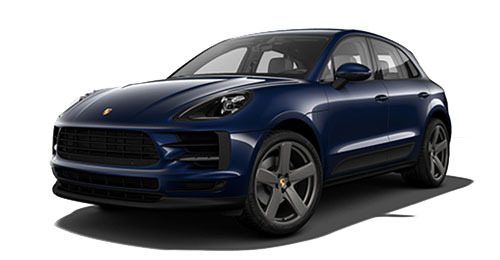 The completely redeveloped Cayenne is even closer to its roots as a Porsche sports car than its predecessor, boasting intelligent lightweight construction, powerful drives, exceptional driving dynamics and smart driver assistance systems. All of this is combined with outstanding handling on any terrain, greater comfort and allround enhancements – with familiar Cayenne finesse. It’s a concept that has made the model a bestseller: Since its market launch in 2002, Porsche has sold over 770,000 Cayennes. The starting line-up is comprised of three models. With its 404 kW (550 hp) biturbo eight-cylinder engine and the driving dynamics of a sports car, the Cayenne Turbo is heading up the new Cayenne generation. 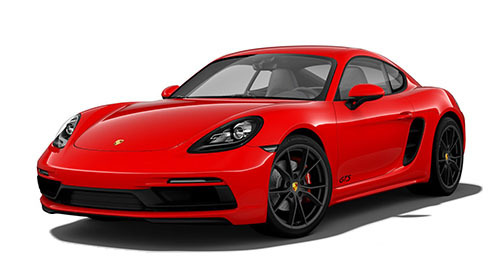 Translated into numbers: The car accelerates from zero to 100 km/h in 4.1 seconds (or 3.9 seconds with the Sport Chrono Package), and achieves a top speed of 286 km/h. 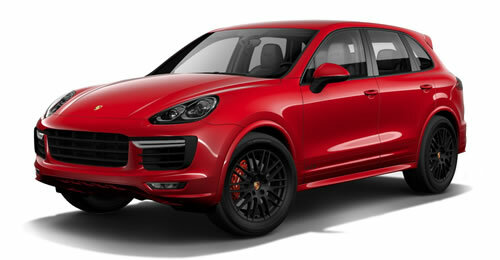 The Cayenne S is powered by a 2.9-litre, 324 kW (440 hp) biturbo-charged V6 engine. From a standing start, the Cayenne S reaches 100 km/h in 5.2 seconds. With the optional Sport Chrono Package, this is reduced to 4.9 seconds. The maximum speed is 265 km/h. 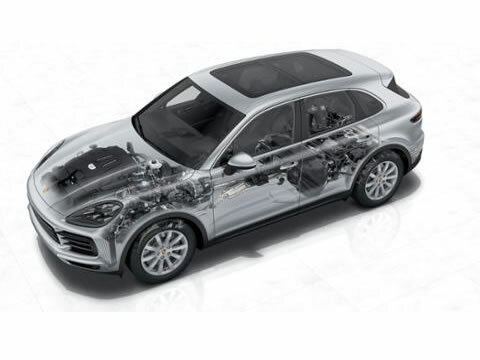 The Cayenne with six-cylinder turbo engine and a displacement of three litres delivers 250 kW (340 hp) of power, ensuring that even the standard model achieves outstanding driving performance. The Cayenne accelerates to 100 km/h in just 6.2 seconds, or just 5.9 seconds with the Sport Chrono Package, and achieves a top speed of 245 km/h. 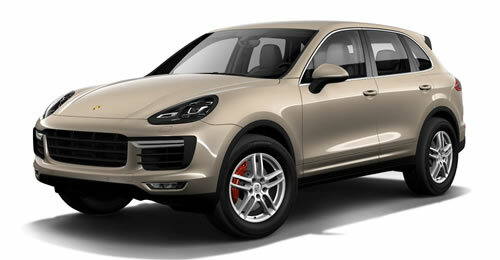 The new Cayenne combines three chassis concepts in one new design: sports car, off-roader and touring car. This involved developing a new lightweight chassis base with a front axle featuring a separated link design and a multi-link rear axle. A typical sports car feature is the new mixed tyres, which are now on wheels of at least 19 inches. The mixed tyres improve stability and driving dynamics on bends. 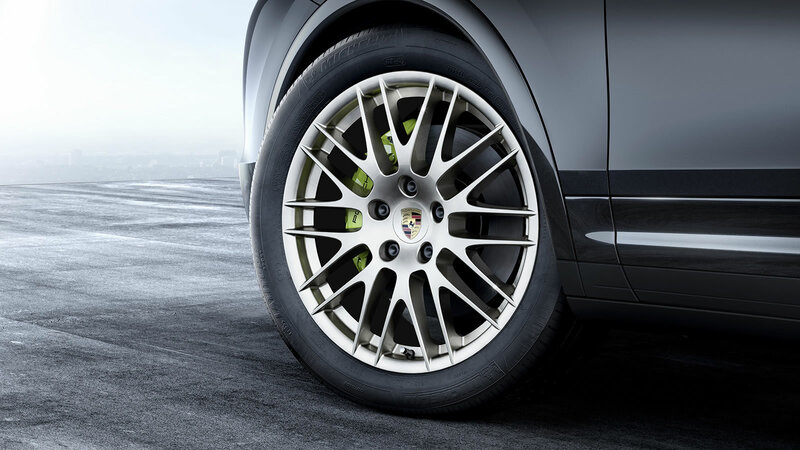 Porsche offers wheel sizes up to 21 inches as an option for the Cayenne. 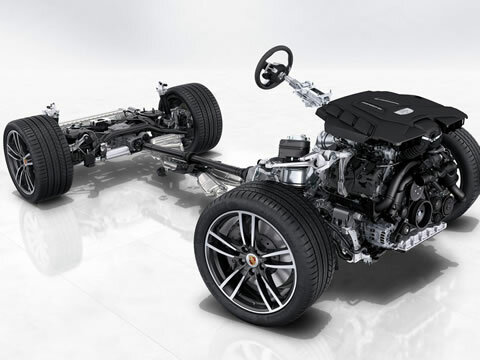 This format provides the optimal basis for the active chassis systems, which are analysed and synchronised by the integrated Porsche 4D Chassis Control system. The system works in real time, optimising handling even further. With the exception of the active PASM damper system (as standard with the Cayenne S), all other chassis systems are new developments. 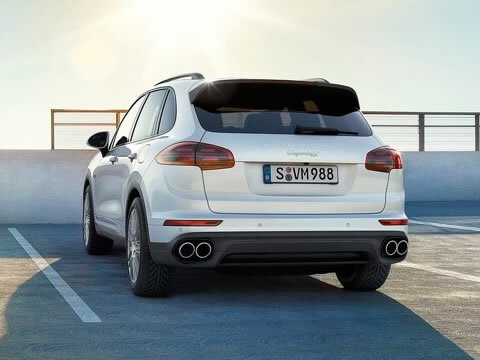 For the first time, the Cayenne is available with electric rear-axle steering. The system, tried and tested both in the 911 and the Panamera, improves agility on bends and stability when changing lanes at high speeds. The reduced turning circle also makes everyday handling of the SUV easier. 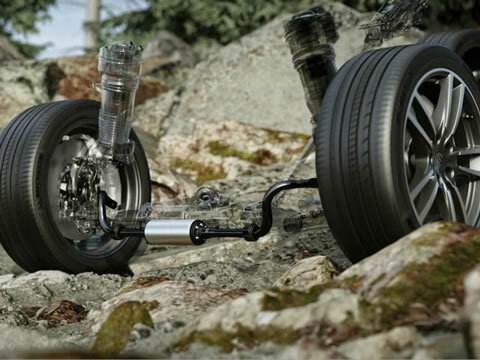 The optional adaptive air suspension with new three-chamber technology significantly increases the spread between a sporty, firm connection and the driving comfort expected of a touring car. Just as before, the system enables adjustments to the ground clearance on rough terrain. 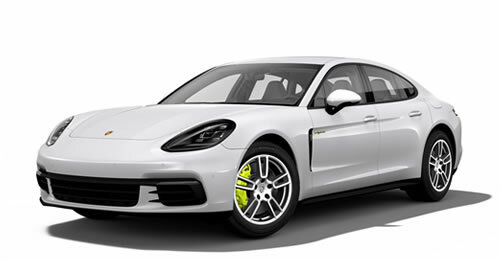 With the optional Porsche Dynamic Chassis Control (PDCC) roll stabilisation, sporty drivers benefit by changing from a hydraulic to an electric system. This switch is made possible by a powerful 48-volt vehicle electrical system. Shorter response times enable even more precision in the driving dynamics – and even more comfort on moderate drives. 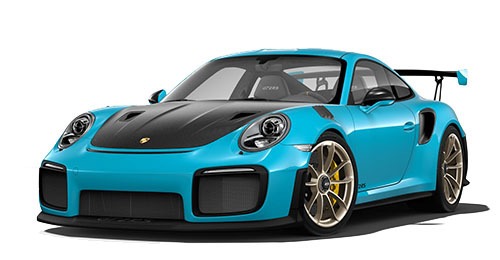 Sports cars need a lightweight construction. 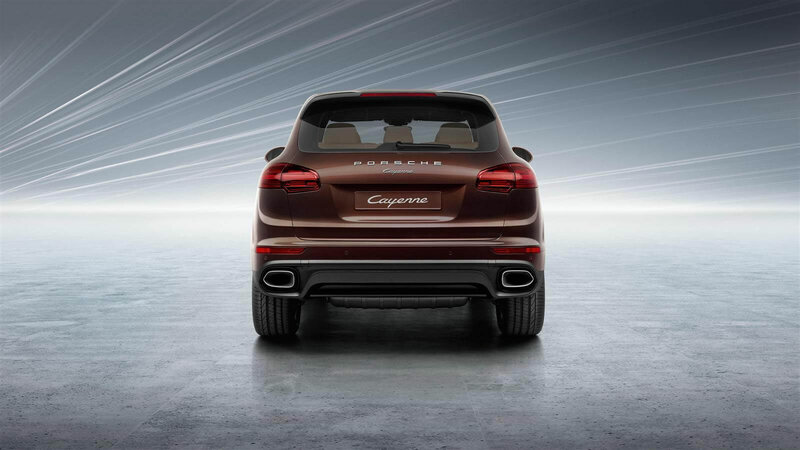 Following the 911 and the Panamera, the new body of the Cayenne also uses an intelligent combination of alloy and steel. The exterior is made entirely of aluminium. The floorpan assembly, front section and virtually all the chassis components are also manufactured from alloy. One particular technical highlight is the innovative lithium-ion polymer starter battery, which alone accounts for a weight saving of 10 kg over the predecessor model. 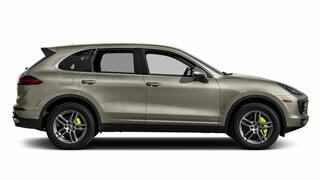 In total, the weight of the Cayenne when empty has been reduced from 2,040 to 1,985 kilograms – even in spite of the significantly extended standard equipment, which now includes LED main headlights, larger wheels, ParkAssist (front and rear), an LTE telephone module including a WiFi hotspot, Porsche Connect services and anticipatory pedestrian protection. 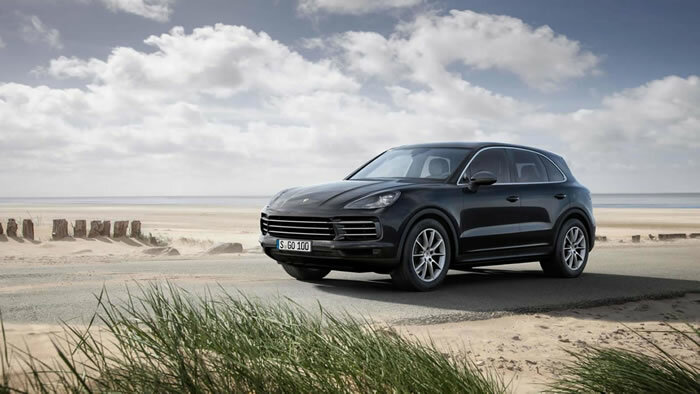 In all new Cayenne models, Porsche now uses Porsche Traction Management (PTM), with an electronically and map-controlled multi-plate clutch, for its all-wheel drive. With its broad spread of torque distribution, the active hang-on all-wheel drive offers huge advantages in terms of driving dynamics, agility, traction and off-road capabilities. The system deploys variable and adaptive strategies to control the distribution of the propulsion force between the rear axle and the front axle. In addition, PTM monitors the driving conditions at all times. For optimum force distribution and traction in dynamic driving, the propulsion force is dosed on bends to allow the tyres to build up optimum levels of lateral support. During off-road driving, the system uses the fully variable distribution of the drive forces between the axles to ensure maximum propulsion at all times. Sporty and precise with a clear design – new and yet familiar: The appearance of the Cayenne has been enhanced in the style that runs through the Porsche Design DNA. The enlarged air intakes at the front are clear indicators of the increased performance. The new horizontal light edges mean that the SUV now appears wider and more athletic, even when stationary. With an exterior length increased by 63 millimetres without any change to the wheelbase (2,895 millimetres) and a roof height reduced by nine millimetres compared with its predecessor, the elegant, streamlined impression of the Cayenne, which is 4,918 millimetres long and 1,983 millimetres wide (excluding mirrors), has been noticeably enhanced. The luggage compartment volume is now 770 litres – an increase of 100 litres. The wheels are one inch larger in diameter, with wider tyres on the rear axle for the first time, emphasising the enhanced driving dynamics. 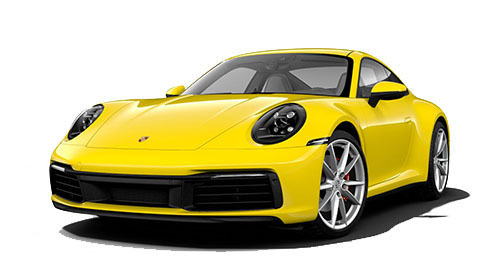 The distinctive, three-dimensional Porsche logo spans the redesigned rear lights with three-dimensional light design and end-to-end narrow strip of LEDs. Porsche is offering a new three-stage lighting concept for the headlights: Every Cayenne is fitted with LED headlights as standard. In the next upgrade, the Porsche Dynamic Light System (PDLS) can be selected as an option, offering a variety of light modes such as cornering light and motorway light. The new LED main headlights with matrix beam including PDLS Plus are the best system available. Fully variable light distribution and intensity are enabled by 84 individually activated light-emitting diodes. 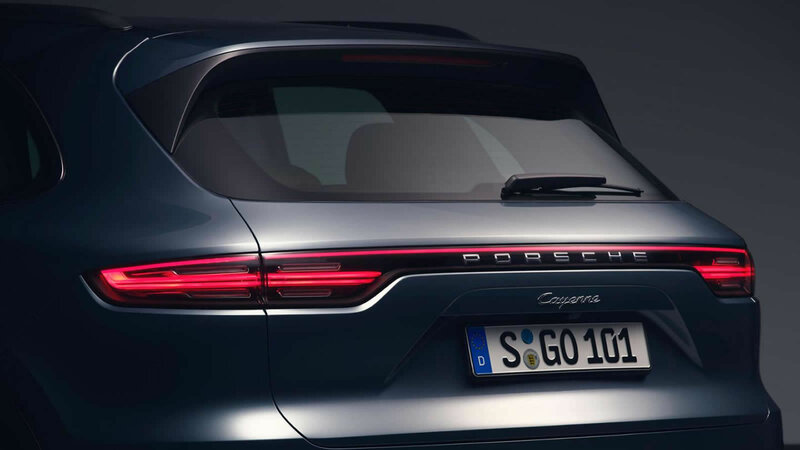 This means that the Cayenne can offer new functions such as high beam that does not glare opposing traffic, as well as adaptive sign glare control. With this new generation, the Cayenne is writing a new chapter in the relationship between driver and vehicle: The Porsche Advanced Cockpit is fully integrated into the sporty, luxurious atmosphere. 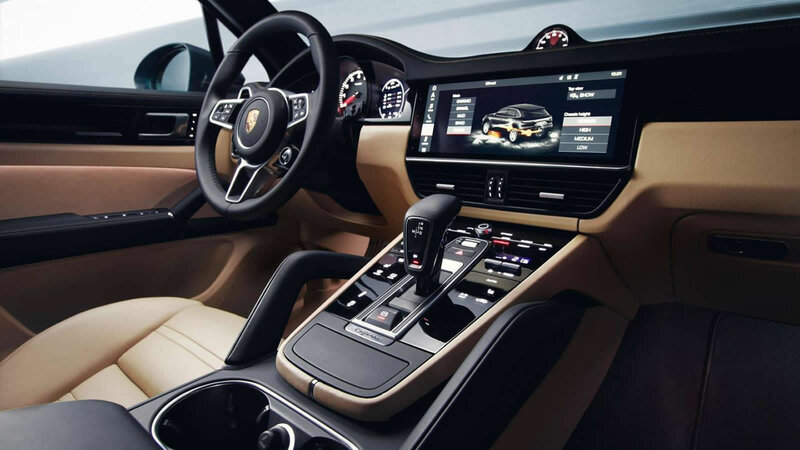 At the heart of the new display and control concept from Porsche is the 12.3-inch full-HD touchscreen from the latest generation of Porsche Communication Management (PCM), launched last year with the new Panamera. A range of digital functions can be operated intuitively – including by voice control. 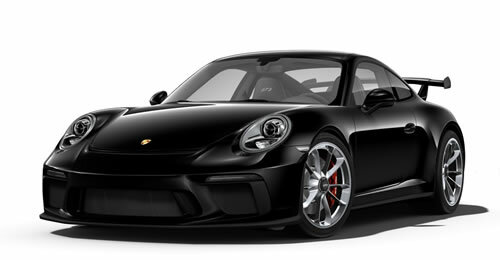 The standard Porsche Connect Plus allows access to online services and the Internet. This includes the standard online navigation with real-time traffic information. The analogue controls on the new centre console are focused on the main functions of the vehicle. Other buttons are harmoniously integrated into the smartphone-like, glass-look touch surface, giving acoustic and haptic feedback when operated. In typical Porsche style, the driver has a central analogue tachometer to view. This is flanked by two 7-inch full-HD displays, which display all other relevant driving data plus additional information selected using the multi-function steering wheel. 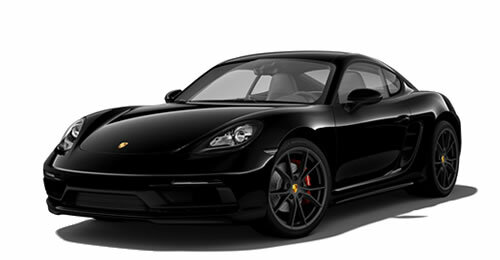 Night Vision Assist with a thermal imaging camera is one of the most important assistance systems, along with Lane Change Assist, Lane Keeping Assist including traffic sign recognition, traffic jam assist, ParkAssist including Surround View and Porsche InnoDrive including adaptive cruise control. The latest generation of the Cayenne stays true to its origins: Unlike conventional SUVs, the driver and passengers in the new Cayenne don’t feel like they’re sitting high up. 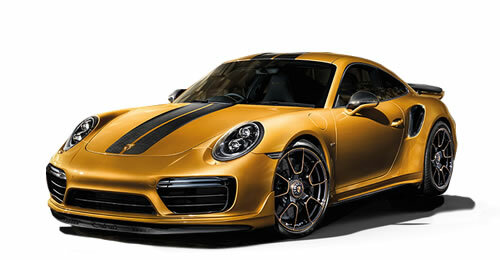 Instead, they are one with the car – just like in every other Porsche. The interior is ergonomically designed around the driver. All operating elements can be reached directly with ease. 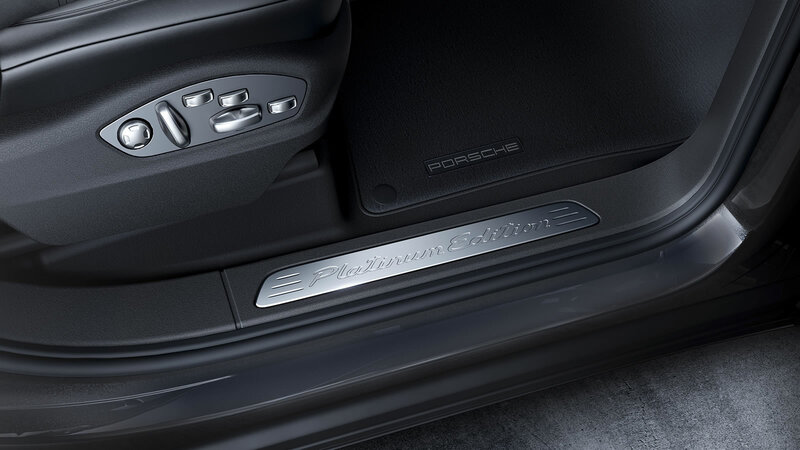 As in a Porsche 911, the Cayenne also boasts the typical, rising centre console. More than just a design element, it provides the shortest and most ergonomic path from the steering wheel to the most important vehicle functions. The multifunction steering wheel is designed according to the same principle and combines outstanding ergonomics with a futuristic aesthetic. 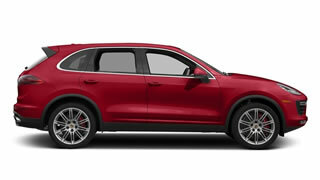 The Cayenne Turbo features a new generation of adaptive sports seats that are more sports-carlike than ever before. The seats in the top-of-the-range model are easily recognisable: as in a sports car, the headrests are integrated into the backrests, rather than attached as separate components. Together with the raised side bolsters and the unique stitching on the seat centre, the sports seats not only deliver a sporty look, but score highly in terms of ergonomics, too. The adaptive sports seats come with heating as standard, plus seat ventilation as an additional option. 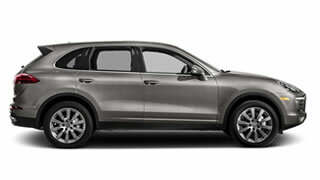 The top-of-the-range seat is standard in the Cayenne Turbo, and available as an option in all other models. If an owner selects the sports seats, the rear seats are finished in the same look, and also receive the raised side bolsters. 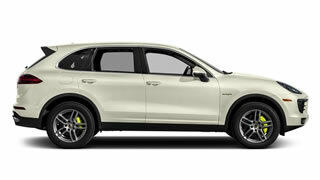 The standard seat in the Cayenne and Cayenne S is the comfort seat, featuring eight-way electric adjustment. 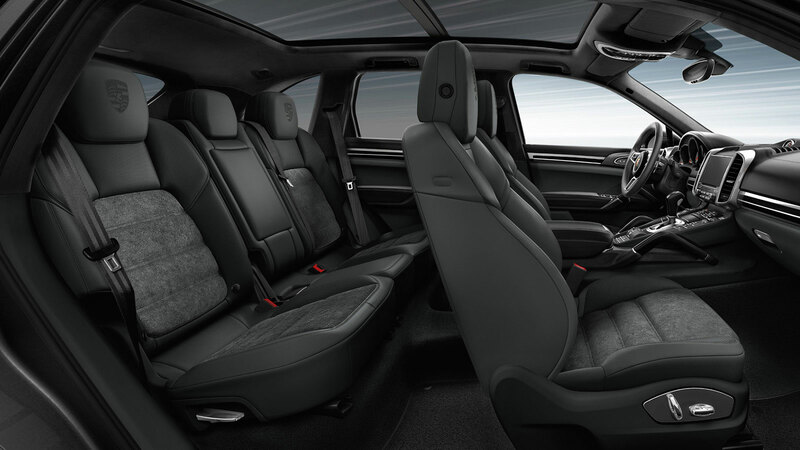 The seat offers secure lateral support for sporty drivers and fatigue-free comfort on longer journeys. In all models, the class-leading, high-quality seats are partially finished in leather as standard. This means that the seat centres, side bolsters and centre headrest strips are finished in leather at the front and back. The rear seat system has a length adjustment range of up to 160 mm, and offers ten adjustment positions in two-degree increments from 11 to 29 degrees. The rear seats also feature a cargo position, with the backrest in an almost vertical position to increase the luggage compartment volume by up to 100 litres compared to the previous model. If even more space is required, the backrests can be folded forwards asymmetrically to create a flat loading floor. 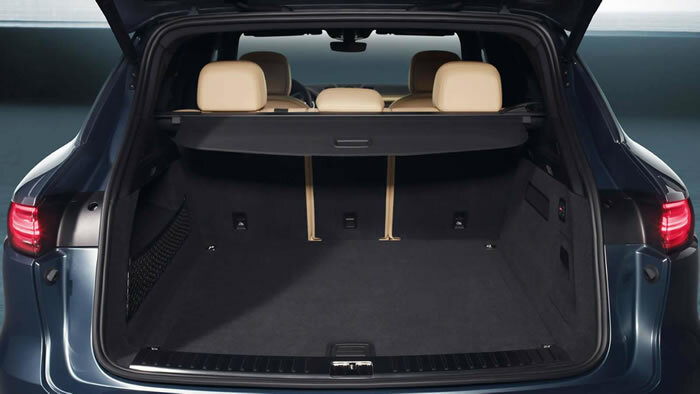 Using these features, the luggage compartment volume can be adjusted between 770 litres and 1,710 litres (Cayenne Turbo: 745 l to 1,680 l) when the maximum possible area is used. Comfort seats with 14- way adjustment, which can also be equipped with seat heating, are also available as an option. In the new Cayenne, Porsche is launching an innovative new braking technology: the Porsche Surface Coated Brake (PSCB). At the core of this new technology are discs with an exceptionally hard tungsten-carbide coating, combined with specially developed brake pads. Compared to conventional grey cast iron brakes, the new system boasts far superior properties – including an up to 30 per cent longer service life. The discs not only wear at a significantly slower rate, but also generate less brake dust accumulation on the rims. The increased friction values of the brakes also ensure improved responsiveness. The PSCB delivers stable braking even under extreme stress. As with the Porsche Ceramic Composite Brake (PCCB), which is still available as an option, the PSCB uses ten-piston callipers at the front and four-piston callipers at the rear. 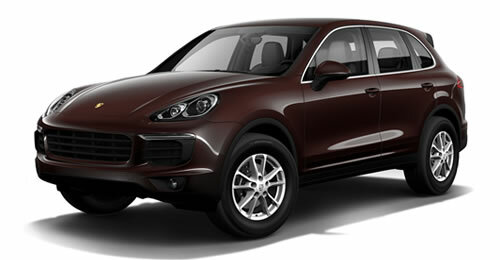 The new Cayenne represents a major step towards the intelligent vehicle. Whether deployed internally or in contact with the environment, networking technology has unlocked countless new functions and reached new standards of quality. The functions are easier and more intuitive to operate. 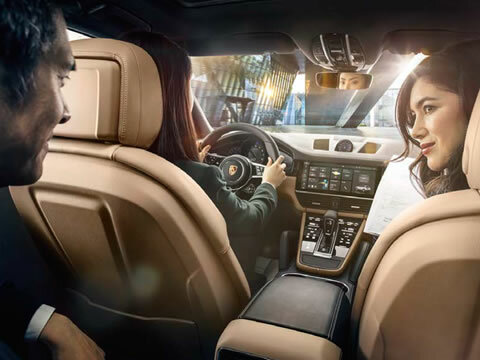 With Porsche Connect, the driver has continuous access to the Internet and a wide range of services. Alongside this, new and redeveloped assistance systems take the burden off the driver. 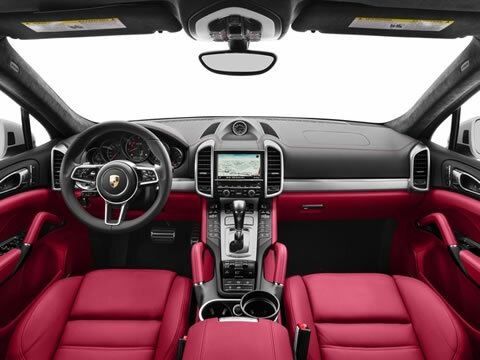 With the Porsche Advanced Cockpit, the Cayenne offers a new type of interaction between the driver and vehicle. The system is based on the display and operating concept of the sports car, originally developed for the Panamera and overhauled for use in the Cayenne. 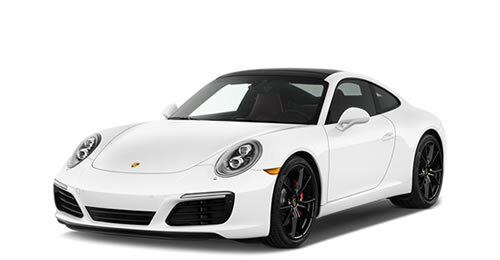 The instrument cluster features the traditional Porsche central tachometer flanked by two seven-inch displays. 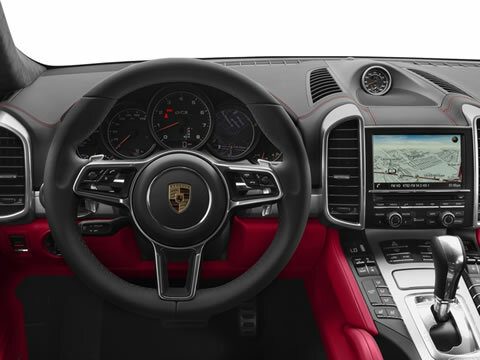 The driver can control all key functions using three core components: The full-HD touch display of the Porsche Communication Management (PCM) system, the multifunction steering wheel to control the on-board computer, and the touch-sensitive Direct Touch Control in the centre console to interact with selected functions. Lane-changing manoeuvres in fast-moving traffic are one of the most frequent risks in day-to-day driving. The optional Lane Keeping Assist system monitors the car’s position using a camera, and responds by providing steering support if the driver leaves the lane without indicating. Lane Keeping Assist significantly increases comfort and safety, particularly on long-distance journeys. In addition to steering assistance, a further audible and visual warning on the instrument cluster can be activated in the PCM. The system is active within a speed range of 65 to 250 km/h. The Lane Keeping Assist system is combined with traffic sign recognition technology. Traffic sign recognition uses the same camera and detects normal speed limits, temporary speed displays, overtaking restrictions and indirect instructions, such as place-name signs. The traffic sign recognition technology is situation-dependent, and also uses other vehicle systems. If the rain sensor detects wet conditions, for example, the speed limit display system will take this into consideration and show weather-related speed limit indicators. The latest, enhanced version of the Lane Change Assist system can also be used as a complement to Lane Keeping Assist. The system uses a radar sensor to detect the distance and speed of traffic behind the car in adjacent lanes. If the speed and distance to the driver’s vehicle are deemed a risk for changing lanes, a warning is shown in either the left or right exterior mirror. The system detects vehicles at a distance of up to 70 metres, and is active at a speed range of between approximately 15 and 250 km/h. 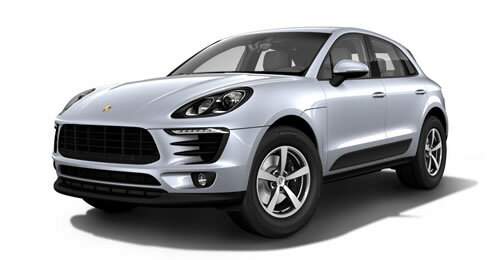 A further feature of the new Cayenne is Turn Assist. After approaching a junction, the Turn Assist system displays an optical warning for objects nearing the vehicle in its blind spot. When pulling off with one of the indicators active, the driver is assisted by the Turn Assist until reaching the activation speed of the Lane Change Assist. Porsche supports the driver of the new Cayenne in day-to-day driving with a three-level system of parking assistance systems. The standard front and rear Park Assist provides visual and acoustic information to the driver when manoeuvring and parking. The system uses ultrasonic sensors fitted to the front and rear of the vehicle. Park Assist is optionally available with a reversing camera. This helps with manoeuvring by showing a colour camera image on the PCM screen with dynamic support lines and distances to potential obstacles. Using four individual cameras, the Park Assist system with Surround View calculates a 360° view, which helps with parking and manoeuvring. The resolution of the camera image displayed on the PCM screen has now almost doubled, making the picture significantly sharper. 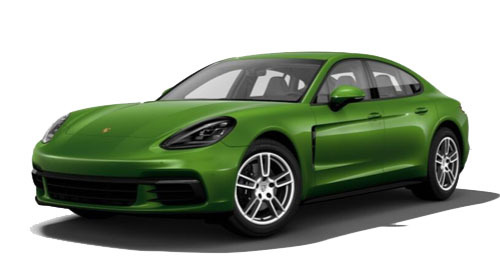 The new Porsche InnoDrive with adaptive cruise control is a particularly ingenious feature: Using the navigation data, it calculates the optimum acceleration and deceleration values for the next three kilometres, and activates these settings via the engine and the Tiptronic S, as well as the brake system. In doing so, the electronic co-pilot takes corners, gradients and maximum speeds into account. It detects the current traffic situation using radar and video sensors and adjusts the control process accordingly. The InnoDrive system, which was developed internally at Porsche, improves efficiency. Vehicle functions such as coasting, deceleration fuel cut-off and braking interventions are controlled in a fuel-efficient manner based on the predictive navigation data. 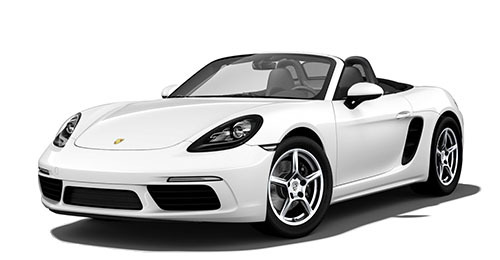 Porsche InnoDrive also brings significant benefits in terms of comfort and dynamics. The system even recognises roundabouts, and adjusts the vehicle speed to match the circumstances ahead. 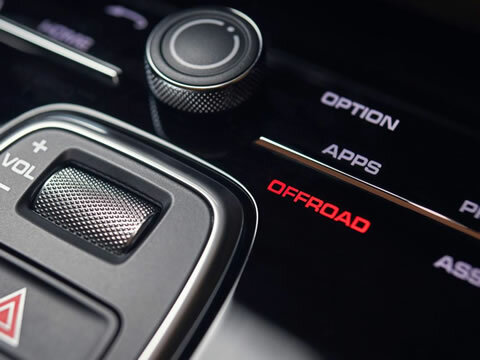 When Sport mode is activated, InnoDrive switches to a more dynamic map. Using the integrated adaptive cruise control system, the radar and video sensors also monitor the distance to the traffic ahead, and permanently adjust this distance accordingly. 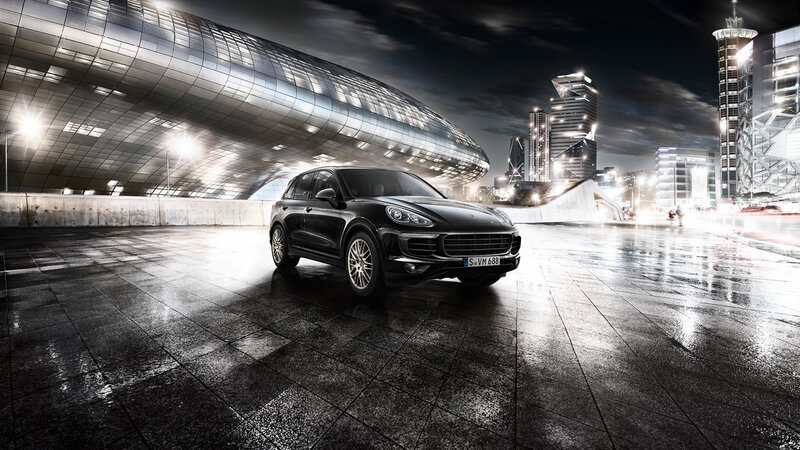 Porsche has equipped the new Cayenne with cutting-edge light technology. The latest LED technology is used in the headlights and the rear lights in all models. 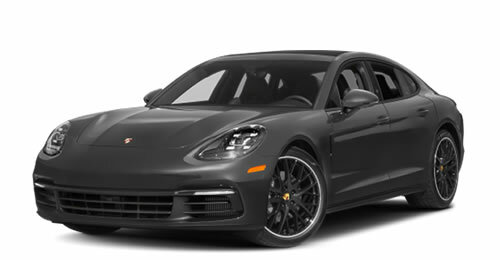 LED main headlights are standard equipment in the Cayenne and Cayenne S; the Cayenne Turbo comes with LED headlights equipped with the Porsche Dynamic Light System. 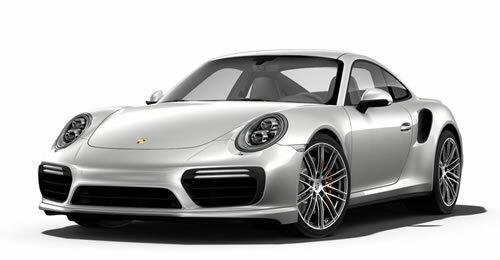 LED matrix main headlights with the Porsche Dynamic Light System Plus are the new top-of-the-range option. This system generates a beam of light from 84 individual LEDs, which work together with upstream lenses or reflectors. The system is also equipped with a camera that detects vehicles ahead, as well as oncoming traffic on the other side of the road. It uses this information to precisely control the distribution of the high beam light to prevent other road users from being dazzled. In the Cayenne, the driver always benefits from maximum illumination of the road ahead – particularly with high beam activated – without affecting other road users. The complex headlight module is made up of several components that can be controlled in a highly flexible and independent manner based on camera data, navigation data and vehicle statuses. Thanks to the intelligent beam distribution, other functions can be integrated that significantly increase driving comfort and safety. For example, the system is capable of detecting highly reflective traffic signs and selectively masking them to reduce glare for the driver. The intelligent light system also provides a special setting for oncoming traffic. The boost function not only fades out the beam directed toward oncoming traffic in segments but also boosts the illumination of the driver’s own lane. This guides the driver’s view, thus increasing comfort and safety. Night Vision Assist uses an intelligent thermal imaging camera to detect people and animals when driving in the dark, and flags up their presence and position to the driver. The system operates at distances of up to 300 metres. The electronics are able to classify the relevant thermal source and to distinguish an animal from a parked motorcycle with a warm engine, for example. Night Vision Assist is deactivated in built-up areas to avoid possible false warnings such as dogs on a leash on the pavement. If the vehicle is fitted with optional LED matrix headlights, detected people or animals are illuminated in a beam of targeted light. The Cayenne is equipped with a cruise control system with speed limiter function as standard, to help the driver regulate the car’s speed and distance from other vehicles. The system can be activated between 30 and 240 km/h. The optional adaptive cruise control increases the range of functions considerably. Using a radar sensor positioned in the middle of the central air intake and the vehicle cameras, the system monitors the distance to vehicles in front and adjusts the distance automatically. It also detects vehicles crossing in front of the vehicle from other lanes. If required, the system brakes to match the speed of the vehicle in front until standstill. Wherever possible, it also uses the coasting function to reduce fuel consumption. The system offers greater driving comfort and safety, particularly in slow-moving traffic. The automatic distance control of the adaptive cruise control is available between 30 and 210 km/h. Thanks to the stop-and-go function, the vehicle is able to pull off again automatically even after braking to a standstill. If the car is stopped for longer than three seconds, a short tap on the accelerator pedal or a restart via the control stalk is all that is needed to move off again. The new PCM now also acts as a command centre for all the driving dynamics systems in the Cayenne. One of the most important changes: The various off-road settings are no longer selected via individual buttons in the centre console, but instead via a specific menu on the screen. In this menu, the five newly defined off-road modes are displayed in 3D against the backdrop of selected scenery. Depending on the selections made, the control system optimally conditions the engine idling, the switching strategy of the Tiptronic S, the PTM all-wheel system, torque distribution to the rear axle, and the PSM stabilisation programme to suit the application. If the relevant equipment is fitted, the modes also adjust the air suspension including ground clearance, the PASM damper system, PDCC rolling-motion compensation and the rear axle steering to suit the off-road profile. The car is configured for road use as standard. If the driver enters easy off-road terrain, such as a gravel track or a wet grass field, he can select the “Gravel” mode. For muddy forest tracks or deeply rutted roads, the driver can use the “Mud” setting. The car also boasts a mode for sand and a “Rock” option for the hard and uneven surfaces found in rugged terrain. 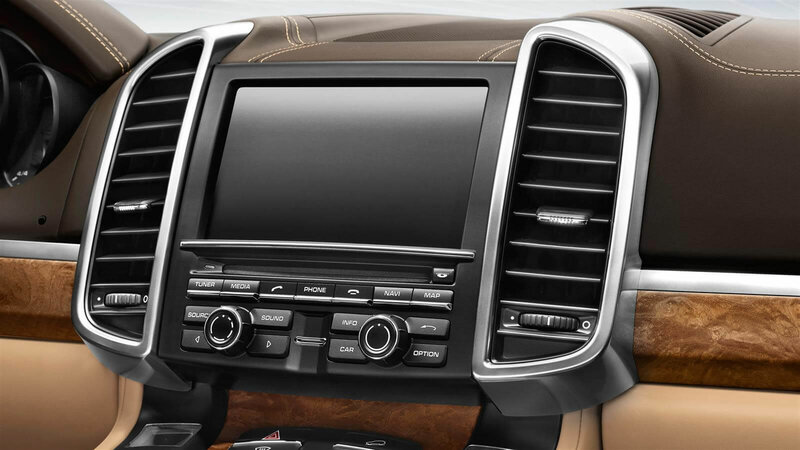 When combined with the optional Offroad Package, the menu offers additional displays for the steering angle, transverse gradient and longitudinal incline which help drivers to get the best out of the vehicle when driving off road. If the vehicle is equipped with Surround View, a Top View function is also available that shows the vehicle within its surroundings. The 12.3-inch PCM display is not dissimilar to a tablet. The system is just as easy and intuitive to operate and adjust to your personal preferences. Using predefined tiles, customers can quickly and easily create a “home screen” with their preferred functions, including favourite radio stations and navigation destinations, frequently used telephone numbers or an option to activate the sports exhaust system. On the right-hand side of the screen, an info widget can be selected to enable access to other PCM functions. Thus, for example, the navigation feature can be displayed in the interaction area in the centre of the screen while the call function is also being used on the right. Up to six individual profiles can also be configured. In addition to defining a large number of interior settings, a profile is also used to store preferences for lights, driving programmes and assistance systems. Just a few taps and swipes are all that is needed to navigate through the menus. The new PCM responds even before the user makes physical contact: If a hand approaches the screen, a column opens on the left-hand side of the screen showing the further sub-functions available in the current menu. The user simply swipes with their fingertip – just like on a smartphone or tablet – to scroll through the options. The new PCM also allows you to zoom in or out and rotate the display using two fingers. 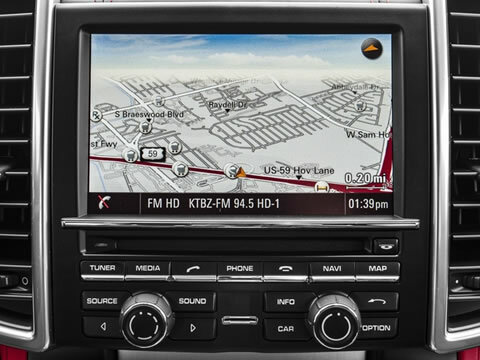 It also recognises handwriting, so you can simply write your navigation destination on the screen. 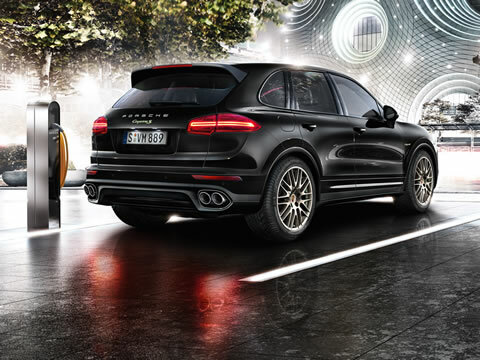 The Cayenne and Cayenne S are equipped with the HiFi speaker system as standard; the Cayenne Turbo comes with the new BOSE® Surround Sound System. The top-of-the-range system is the latest version of the Burmester® 3D High-End Surround Sound System, featuring the new Auro 3D® format, which creates a realistic concert hall atmosphere within the car. Door sill guards in stainless steel with "Cayenne" lettering at front"
Door sill guards in stainless steel with "Cayenne turbo S"